In the fast-paced ED environment, seconds count. Technology must be easy to use, allowing clinicians to focus on their patients rather than focusing on their equipment. Spacelabs helps to facilitate greater clinical efficiency by standardizing workflows, providing tools to assist in clinical decision making and decreasing alarm fatigue, while also improving patient throughput. Early, error-free admissions are critically important because some days, “fast-paced” doesn’t even begin to describe the ED environment. Caregivers can speed admissions by utilizing a barcode scanner on any monitor to automatically admit a patient to the monitor, simultaneously discharging them from any previous monitor with Spacelabs SafeNSound. Automated ADT can also help you reduce errors related to manual admissions and device management. Once the patient is admitted, alarm parameters should be customized to the individual. Studies show that a decrease of up to 42% of alarms can be realized simply by customizing alarm settings for each patient. * Spacelabs offers default settings for six different patient types are designed to make it easy for clinicians to ensure that their patients are being monitored appropriately while requiring minimal intervention. With Spacelabs’ learned alarms, once a patient is connected to the monitor, the heart rate and rhythm are learned, and customized alarm limits are set for each patient without requiring any clinical intervention. Quickly determine patient status and achieve STEMI goals by utilizing tools that assist with clinical decision making. 30-60 minute real-time ST trend assists in monitoring your patient’s ST status in real time and facilitating early intervention. 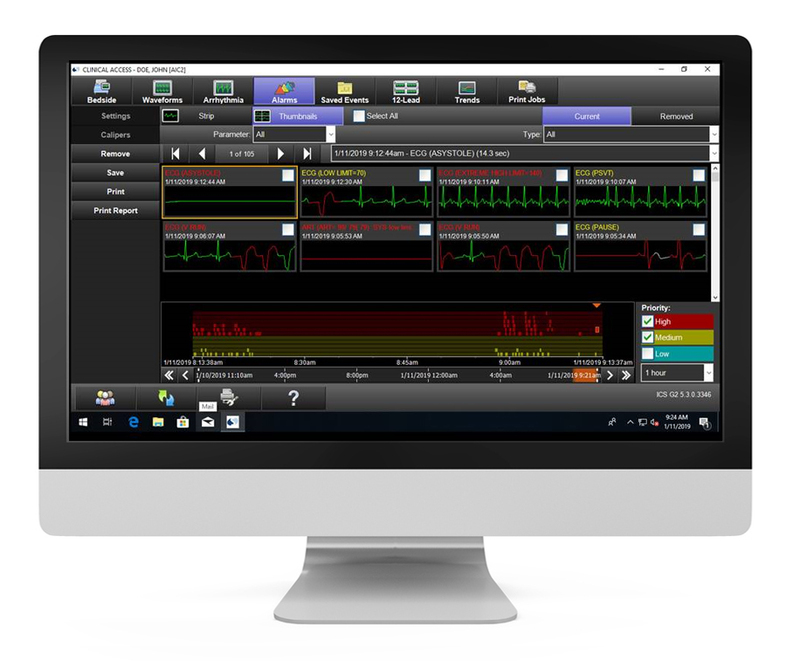 Obtain a diagnostic 12-lead with interpretation on the bedside monitor in seconds and print to any networked printer, and/or send automatically to your ECG Management system. Monitor thrombolytic therapy by simultaneously viewing 12 leads in real time. Create and review custom ST trends from any monitor or computer with network access. Collaboration is imperative in ED environment. Utilize 3-for-1 Smart Disclosure, which includes remote collaboration for a virtually unlimited number of clinicians from any computer. Remotely access waveforms for consultations and additional oversight. Review retrospective waveforms, alarms, arrhythmias, and histograms. Capnography monitoring in the ED is becoming standard practice and is essential for properly evaluating a patient’s ventilation status. The Joint Commission strongly recommends its use in procedural sedation, and studies have demonstrated the significant impact of capnography in the care of intubated patients, patients in cardiac arrest, and as an adjunctive therapy in the management of mechanically-ventilated patients. Quality patient care requires effective management of patient data flow. 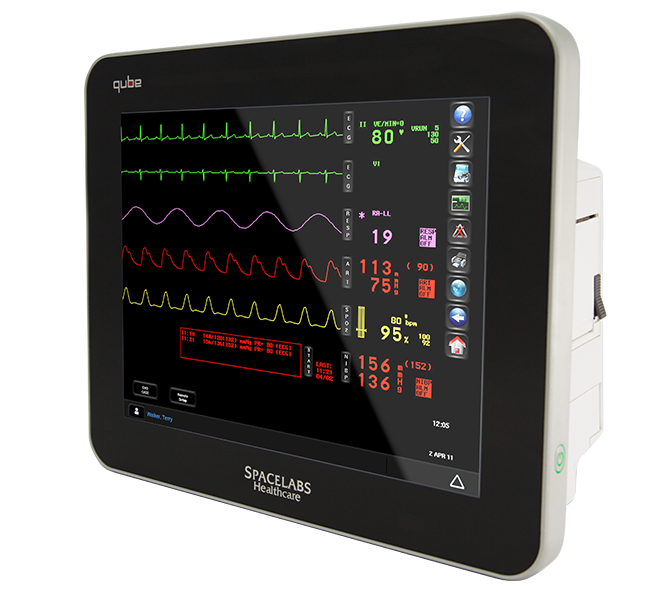 With Spacelabs’ monitoring solutions, the moment a patient is connected to a bedside monitor, an electronic chart is created for that patient with vital signs and waveforms automatically transferred, even in transport. Upon admission to the monitor the patient is associated with that information, creating a seamless record. 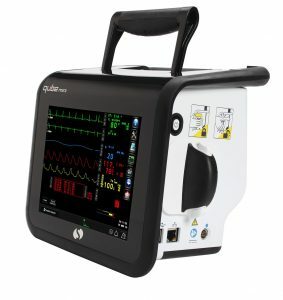 Utilize Qube Mini for transport, or simply undock the wireless Qube monitor to transport patients without compromise. Move even the highest acuity patients while maintaining full monitoring capabilities, including capnography. After transport, Data Shuttle electronically transfers all of the patient’s demographics and monitoring data from the transport monitor to the new monitor, simplifying the ADT process. Simultaneously discharge from the previous monitor while admitting to the new monitor. Improve patient throughput and provide better care with 24-hour Holter-like analysis. Determine, with confidence, if a cardiac patient is ready for transport out of the ICU or to home.